One of the great things about living in Cleveland is when the roads are too icy and snowy and generally in poor condition to make a quick run to the supermarket. Because sometimes your last dregs inspire the most delicious dishes. I love when I throw something together out of necessity and it ends up being a home run dish. 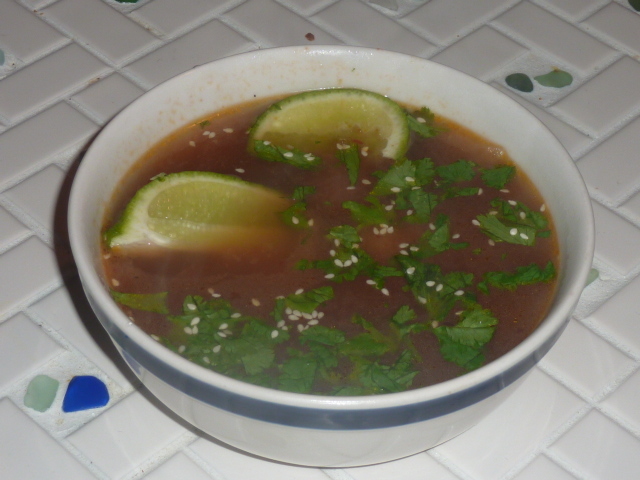 This wonderful soup reminded me of a mixture between Vietnamese phở gà and Chinese hot and sour soup in its flavors, but was much, much easier than both of them to prepare. It was on the table 30 minutes after grabbing the first ingredient out of the refrigerator but managed to have a very, very impressive depth of flavor. I could not stop eating this and am seriously considering grabbing another bowl in the near future. It has the perfect mix of spice, citrus, and savory. The textures are also perfect – the slight crunch of the onions and the silkiness of the rice cakes. I really can’t say enough about how yummy this soup is. I highly recommend homemade chicken stock here, because the broth of the soup is the true star. Additionally, do not skip a healthy squeeze of lime, as it is what really makes this dish sing. Heat vegetable oil in a medium stock pot over medium-high heat. Add ginger, garlic, and onion and sauté until fragrant, 1-2 minutes. Add soy sauce, rice wine vinegar, fish sauce, garlic chili sauce and chicken stock and bring to a boil. Simmer, covered, roughly 15 minutes to allow flavors to combine. While simmering, thoroughly rinse rice cakes. Add to broth and cook 1-2 minutes until all rice cakes float and are tender. Garnish with sesame seeds, lime, and cilantro. I certainly would not characterize this as a classic “sweet and sour soup.” It is very dissimilar from the sweet and sour soup you would find in your average Chinese restaurant. However, the flavor is slightly sweet, thanks to the honey, and slightly tangy or sour due to the rice wine vinegar. Overall, it’s very yummy, healthy, and, despite a lack of noodles and meat, very filling. Having made this dish a few times, I can guarantee that it is delicious with a great variety of vegetables and noodles. I prefer the non-noodle version because it’s a little healthier, and I’ve found the vegetables in this version to work best together. Combine all ingredients and marinate overnight. Before beginning the rest of the soup, separate the tofu from the marinade, reserving marinade. Place the tofu on a few paper towels in order to let it dry. In a medium stock pot, heat 1 tbs. olive oil over medium heat. Add carrot, celery, onion and cut mini-corn and sauté until onion is translucent and carrots and celery are tender and mini-corn heated, about 5 minutes. Add reserved marinade, chicken stock, beef stock, sesame oil, honey and rice wine vinegar. Cover and allow to simmer over medium-low heat roughly 20 minutes. If you want to simmer this for longer, just make sure it does not over-reduce. Before serving, be sure to taste the broth and adjust the seasonings as necessary. About ten minutes before serving, heat canola oil over medium-high heat. Add dried tofu squares and sauté until tofu is golden brown on all sides. Add to soup. 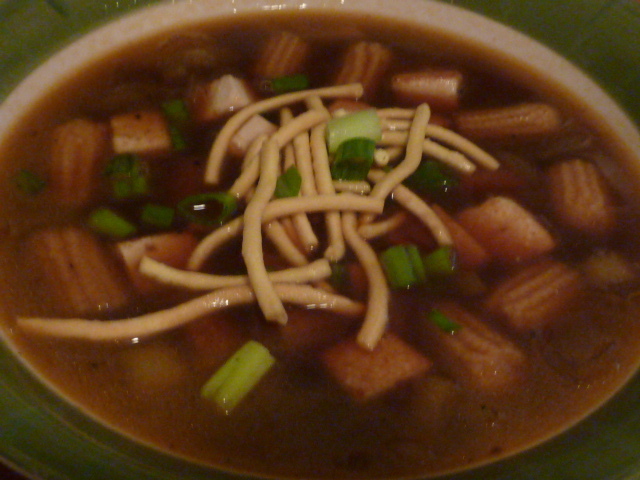 Serve soup topped with a small handful of green onion greens and crispy friend noodles.